Yes it is possible to to create the work below with a 'Coggan' 'Cortini' etc. Template, but the gravers are not magical tools. You have to have a certain amount of artistic skill to start with, having said that they do give you a head start, and they take the guesswork out of the 'am I sharpening it right' situation! That's the key once again, isn't it Phil? Your bulino point lets me make the lines you make - as the other styles let me make other lines, but it's still up to me to do something with those lines. Phil, Is this point to make lines too or is it just for dots and short dashes? Do you have another point with a small heel that you use for lines in scenes? This does it all! In game scenes it's good for long and short ultra fine lines, also for medium deep lines ie. the left hand shaded edge of the ele scene, dot work, in fact everything you need for a gamescene. I also used it for the fine shading lines on the scroll in the picture. Oh! and it's also good for lettering. All my gun naming is done with this tool. It can be used for a complete letter or by combining it with a flat. Thanks Phil, But how does the point keep from diving when cutting lines since it doesn't have a heel? I talked with a print maker engraver once that said he didn't use heels on his gravers and I didn't understand how he kept the point from diving. If it does start to dive you just drop down to a shallower angle, it might take a bit of getting used to after a heel, I find that mine never dives, i've used one from scratch if you pardon the pun, in fact for game scenes I find the heel makes the tool too steep and uncomfortable. All I can say is try it and see. Ken, it should work on curves, but it's not designed for DEEP tight curves. Phil, Do you have to sand the shading cuts back a bit to get rid of burrs or just leave them? I know the 70 degree Italian bulino tool requires sanding it back and am curious as if you do this also. Thank you and wonderful work as always. Rock&Roll! On the majority of lines you should'nt get any burrs, you might get slight ones on deeper tight curves. Game scenes are not sanded back at all, this is very important. I also don't sand back the shading lines on scrolls, if there are any, they will be very very small. 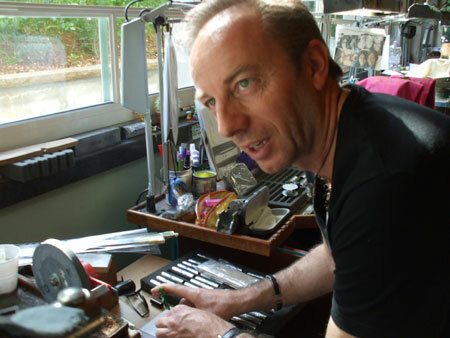 When I was in Italy and visiting some big name engravers I made a comment about there being no heel on their tools and they looked at me like I had two heads. I understand the dot picking method now and have cut some lines with a tool with no heel. It takes alot of practice to do bulino in steel. 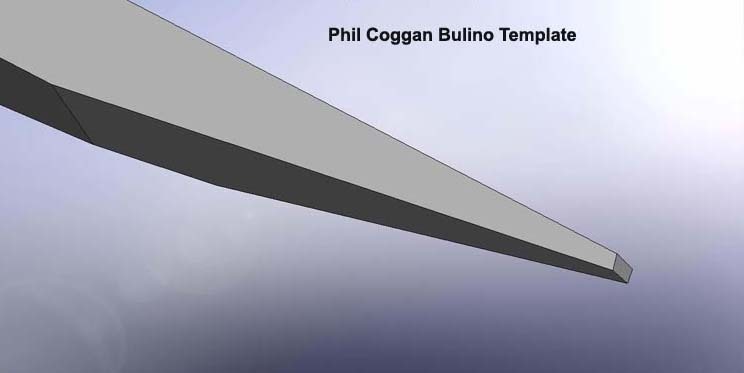 Phil, in the example you posted it looks like the tool is a flat but I assume that is just a problem with the graphics. I assume the tool is a point. The angle of the face I think is 45 degrees, this can be steepened by up to about 10 degrees for harder metal. Well I didn't have a few beers but it could just be these old eyes, I maybe should use my optivisor. This is the exact shape tool I use for almost all cutting, Modified larger or smaller face of attack depending on cut size desired. Works well for Buliono & Puntinni, ( Dots, picking method, maybe a little flatter face of attack but much the same). It may have something to do with us guys with a Hammer & Chisel background. I heard Italians sharpen their bulino this way too. Phil's and Dario's are basically the same. Just different angles. The templates make both as well as other various points easier to sharpen since there is no guess work remembering one point's angles to the next. This looks to be a 60 degree. Is that right?, or what angle is it? I thought this was rather interesting. It's out of an old book on engraving (late 1800s, early 1900s I think). There you go...and all these years later, the same tool and the same way of sharpening. As for the angles, Dario's and mine would be slightly different, in fact if I sharpen by hand no two would be exactly the same. It is very difficult when holding the tool against a grindstone wheel to be accurate. This is the benefit you get with Steve's templates. I watched many Italian engravers work in Brescia. 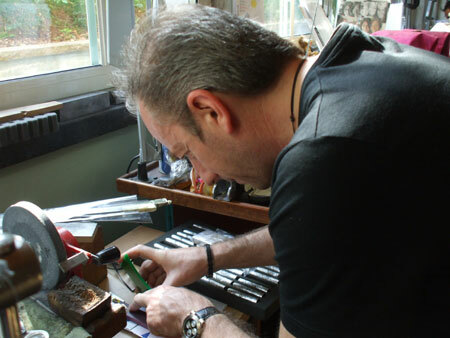 And in the words of Dario there are as many ways to sharpen a graver as there are engravers. Perhaps it is because God did not make all of our hands the same shape. While using an Italian graver there is always a chance of losing control and gouging into the metal. It is a little like riding a bike. Steve if you recall the graver I sent you that Dario ground out for me the bottom of the v was mostly removed leaving only a small part of the v at the cutting end as I recall perhaps a 1/16 inch at the most. This is what is used to creat clearence. As far as making dots, dashes, and lines; a line is only about .0005 of an inch in width. A dash is a short line and a dot is a line as wide as it is long. I will try to get photos the next time I am in Italy for you guys. My tool has the bottom PARTIALLY ground away,and there are two reasons for this. One... it allows the tool to be dropped when it starts to dive. Two... when sharpening by hand (not templates) with an oil and Arkansas stone, you need a certain amount of 'Flat' area on the sides of the tool to stop it from rolling. All the engraving that i've posted on this forum has be done with this tool, scroll, gamescenes, portraits and inlay. I have been using it (Push & Hammer) for twenty six years and if you use it correctly, it won't dig in. Yes of course please use the photos. Thanks again Phillip. Here are the photos of Dario. The flat on the bottom how close to the tip do you grind this. Does this work like a heel so it would be fairly close to the tip or farther back. I used the graver without the bottom portion ground out and it does great straight lines. I stumbled into this chat on it's grind and found out there is a bottom to the graver. I seen the flat on the template but did not utilize it. So now I wish to know how much or how little. Hi Phil, I received your template, today I wonder if you can use to make shadows, I'm new in this world, and all are questions for me. Which graver blank is best for Bulino being done on Guns? Carbalt, M42, or HSS? When you can get away with it use carbalt but the more narrow of V graver angle you make (fragile of point) the chance the carbalt point will break increases. If the point is breaking first dub the point slightly and see if that helps but if the point is still breaking go with the M42. 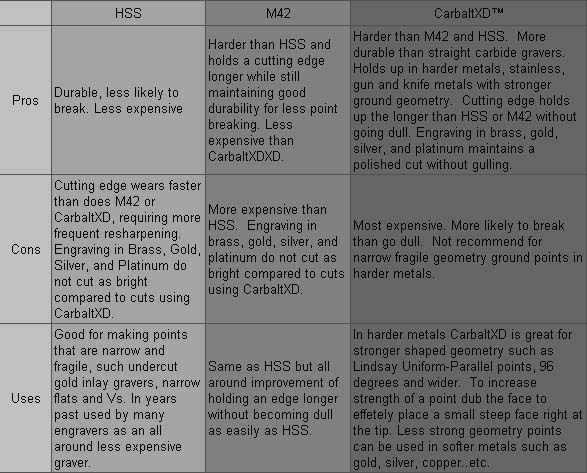 The carbalt will hold an edge longer than M42 but it is more fragile than M42 or HSS. Here is a chart showing pros and cons of each. Does the little flat where the other templates have a point at the bottom of the "V" serve any purpose in the use of the template? I bought one a while back and want to give this grind a try and making sure I do it right. thank you Phil and Steve for all the great information, it will help greatly in the coming years of practice.